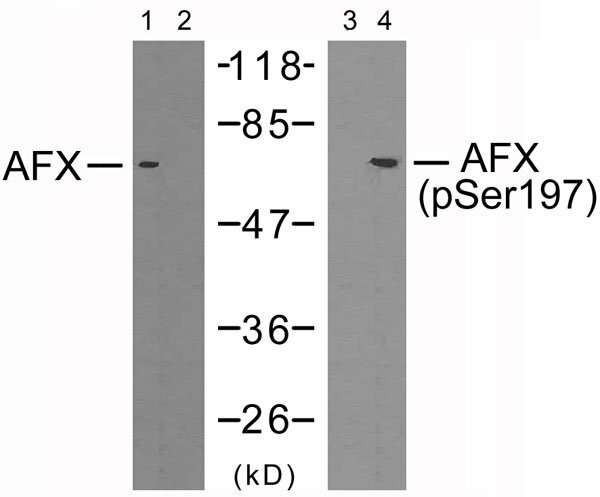 AFX (phospho-Ser197) antibody detects endogenous levels of AFX only when phosphorylated at serine 197. The antiserum was produced against synthesized phosphopeptide derived from human AFX around the phosphorylation site of serine 197 (A-A-SP-M-D). Small volumes of anti-AFX antibody vial(s) may occasionally become entrapped in the seal of the product vial during shipment and storage. If necessary, briefly centrifuge the vial on a tabletop centrifuge to dislodge any liquid in the container`s cap. Certain products may require to ship with dry ice and additional dry ice fee may apply. 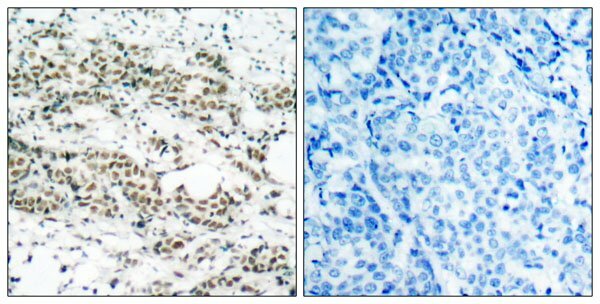 P-Peptide-+ Immunohistochemical analysis of paraffin-embedded human breast carcinoma tissue using AFX (phospho-Ser197) antibody. Western blot analysis of extracts from 293 cells using AFX (Ab-197) antibody (Line 1 and 2) and AFX (phospho-Ser197) antibody (Line 3 and 4). NCBI/Uniprot data below describe general gene information for AFX. It may not necessarily be applicable to this product. Transcription factor involved in the regulation of the insulin signaling pathway. Binds to insulin-response elements (IREs) and can activate transcription of IGFBP1. Down-regulates expression of HIF1A and suppresses hypoxia-induced transcriptional activation of HIF1A-modulated genes. Also involved in negative regulation of the cell cycle. Involved in increased proteasome activity in embryonic stem cells (ESCs) by activating expression of PSMD11 in ESCs, leading to enhanced assembly of the 26S proteasome, followed by higher proteasome activity. Di Maira G, et al. (2005) Cell Death Differ; 12(6): 668-77. Essers MA, et al. EMBO J 2004 Nov. 11. Brownawell AM, (2001) Mol Cell Biol; 21(10): 3534-46. Kops GJ, et al. (1999) Nature; 398(6728): 630-4. 1. Negative expression of FoxO3/FoxO4 and lymph node metastasis were the risk factors for the poor prognosis of bladder cancer.